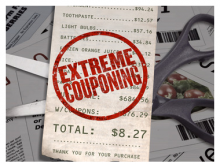 I’ve been struggling with what to say about the new Extreme Couponing Series on TLC. I was excited when I first heard about this show. I thought, “Wow, this is really going to help people learn to shop smartly.” But after seeing the first run of shows, I’ve changed my mind. I believe this show is going to make it difficult for those of us who use coupons on a regular basis. It’s hard enough when you have a small stack of coupons and a line of other anxious customers behind you. I regularly get looks by fellow shoppers wondering how many coupons I plan on making the cashier scan. Imagine what it will be like if this show gets lots of viewership, and people start think you’re nuts if you hand over any amount of coupons, or have multiples of a few items.